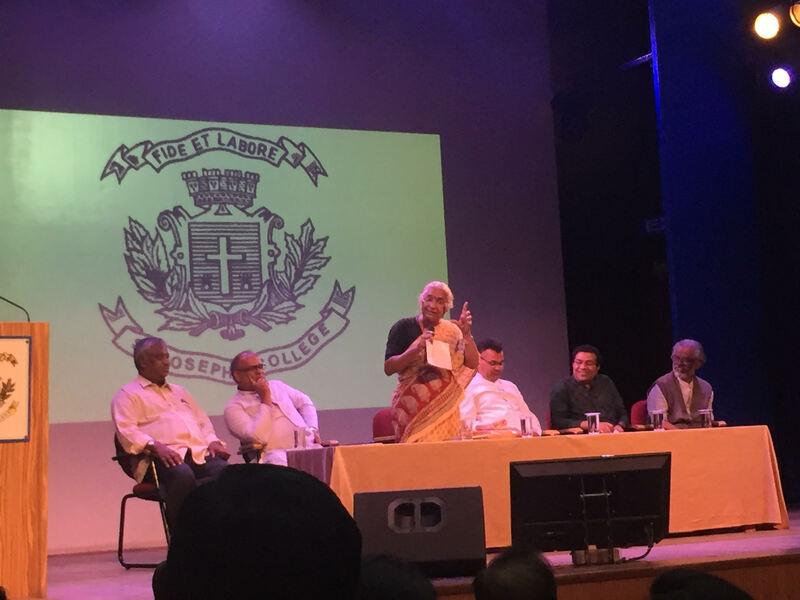 "Jail is a fine place, even for activists to go for a retreat"
Social activist Medha Patkar was at St. Joseph’s College on 23rd November to deliver The Dr. Fr. Ambrose Pinto SJ Memorial Lecture. In the auditorium, the audience sat like coloured pixels with all their multi-colored sweaters and jackets, complaining and appreciating the weather in the same breath. When the emcee, Prof Latha Paul from the Department of Social Work came on stage, the audience fell silent. The men in white robes entered the auditorium, and the applause was in sync with their steps. Among them was a frail, old woman who waved at the crowd, walking slowly to the dais. Medha Patkar, the social activist has fought tirelessly for the rights of Tribals, Dalits, Farmers, laborers, and Women. Her mannerisms, on the other hand might still remind one of an excited student waiting for someone to appear on stage. Through the proceedings onstage and the speeches by dignitaries praising both Dr. Fr Ambrose Pinto and her — Medha Patkar sat like a rock. When she began talking, her voice crackled but without pause. “The fight for human rights and the constitution is the ultimate award” she said. Medha Patkar on the mic is like Rajinikanth from Kaala. You don’t see her wearing black clothes or swagger. But her smudged glasses, wrinkled saree and her will power were more than enough. When she spoke of the unequal distribution of wealth in our country, she observed that “We have failed the farmers, our core contributors to the society and economy.” Occasionally, she switched to Hindi, and when she did – she asked the crowd whether they were comfortable with the language. “Mera Channel ab Hindi main hai, please adjust”, she smiled. After a while, a few sleeping members of the audience were rudely awakened by panicking loyal friends when Medha Patkar started waving at the audience. But they were relieved when they saw that she was only waving at a colleague she’d just noticed. Referring to herself as an urban activist and intellectual, she said that her world expanded more when she joined the people fighting for their land in slums. At this point she brings the audience’s attention to the word ‘Slum dwellers’ and urges the them to not say that. “Their houses are one of the most beautiful and bountiful. They always have the purest intentions in their mind. We are the Parasites, we live on everything they do. Yet, we don’t give them the respect they rightfully deserve” – saying so she admonished the government’s apathy towards landless laborers and Dalits. She urged the youth to participate in the farmer’s march on Nov 29th and 30th. Almost as if guessing what was in the audience’s minds, she quickly added with a smirk – “Jail is a fine place, even for activists to go for a retreat” which pushed the audience to applaud loudly. The applause went berserk when she pointed out in the same breath that an excess of development seemed to be occurring when it came to building statues despite depleting natural resources. At this point, even our sleeping friends woke up to join the cheer. She recalled Dr. Fr. Ambrose Pinto’s passion for changing the society and motivated the students to fight for human justice like he did. After she stepped down from the dais, she was just like everyone. Holding a plastic cover in one hand, a memento in the other, she slowly walked towards the exit as the students stood in full alertness. Pingback:Yatra – Another Writer Guy.